The Magic Hair Removal Wand is a simple device for removing unwanted facial hair without waxing, bleaching, tweezing or shaving. 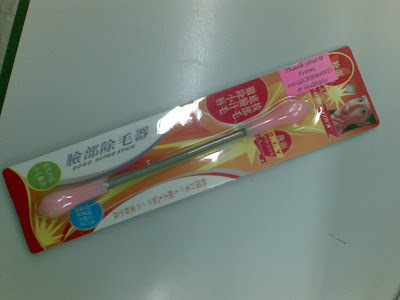 When used properly, the wand removes facial hair by the roots quickly and effectively. Each wand comprises of a spring made of nickel-plated carbon steel and plastic handles on each end. Approximately 7.5 inches long. Comes with instructions on proper use and care. Made in China. 1. Bend the wand downward like an inverted U and place against your face where there is unwanted facial hair. Hold the handles using thumbs, index and middle fingers. 2. Roll or turn the handles inward and outward between your fingers in a continous motion. You will feel a tingling sensation as hair is being lifted by the roots. Move the Magic Hair Removal wand over the the same area again and again, constantly rolling and turning the handles between your fingers until all the hair is removed. All it takes is just a couple of times to get the hang of the wand. Remember, practice makes perfect! If you are not used to removing hair by the roots, you may experience some sensitivity while the hair is being lifted. With regular use, your skin will get accustomed and sensitivity will lessen. 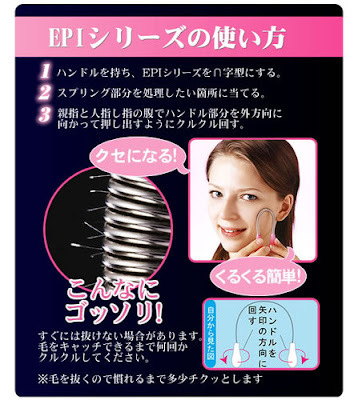 Always check to see that your skin is not damp or oily before using the Magic Hair Removal wand. When removing hair from the upper lip, stretch skin by pushing outwards with your tongue to maximize the effectiveness of the wand. This exercise can be repeated when removing hair from the cheeks or below the lips. Make sure that you keep the wand bent in an inverted U as you use it and that you roll the wand against the direction of the hair growth. Frequency of use of the wand will vary from person to person. It can take anywhere between 3 days to 4 weeks before having to use it again. Hair does not need to be fully grown to use the MHRW. For use only on the upper lip, chin, cheek and neck areas. Do not use on eyebrows, bikini area or any areas not specified..
* you need a LOT of practice! =P Took me several minutes before I figured out how to properly use this. * before using make sure to cleanse, tone and moisturise. Its important that your skin is clean to prevent bacteria from growing. Make sure skin is dry before using. ADDICTION FACTOR: Yes, will repurchase! yeah very! especially im not used to threading/waxing, but really does work..